The EdCan Network’s School Calendar, published annually, provides all opening and closing dates, statutory holidays, and spring breaks for mid to large school boards across Canada. This free downloadable resource is an essential tool for parents, community groups and our associate members (education not-for-profit organizations and stakeholder groups) for effective event planning. 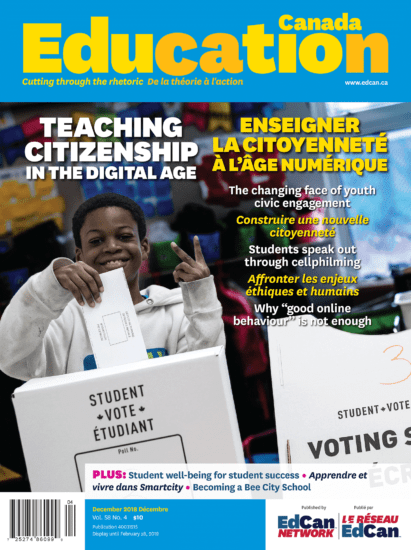 Check our most recent Education Canada Magazine issue: Teaching Citizenship in the Digital Age. Looking for more useful information about the school year? We are passionate about education in our public schools in Canada. Every month we make sure to share with you the latest findings in achievement, pedagogy, parent engagement, mental health, well-being, effective teaching and more. Sign up for our monthly newsletter about the latest in public education.